Hello everyone! Well it's finished at last! The Moorland blanket, details here, I started it in January 2017 and finished the last stitch on Friday night. It could have been finished much earlier but... excuses, whoever wants to listen to those! I did enjoy crocheting it and unpicking bits too. I'm a perfectionist when it comes to crafting and it has to be right. Many a time after working on it, I've had to frog it, oops! Too much chatting at Knit 'n' Natter. Whilst I was busy crocheting away, I kept thinking about 'the next blanket', as you do... but now I've finished it, I'm just not sure. As this one was a CAL (crochet a long), the idea is to stay on target. Of course you can take as long as you like or need but it does become an issue after a while, knowing that you should be working on it but itching to start something else. Lucy over on Attic24 has many other blanket designs I could consider. I've loved making this, each stitch including the edging was enjoyable. The colours are rich and soothing, the pattern with its neat wave going up and down showed the stitches were lining up correctly. The Knit 'n' Natter group have loved seeing its progress so I'll take it along soon to show them. Making the blanket has produced a bit of a yarn stash and as I was wanting to make some bunting, this will be made in some of the Moorland colours. The bunting is just for celebrating birthday etc not to be left out all year. The Moorland colours, when together, are ideal as they are fairly gender neutral. For now I'm enjoying 'the finish'. It's good to be able to look at other things and think, yes I can make that. I have free time! I've started a small reindeer kit that was free in Crochet Now magazine. I'm not sure I'd buy it again, at £5.99 I think it's a bit pricey. I started a knitted Shawl last year that needs finishing, that was a KAL (knit a long) with a picot edging and beads. Like many people I have a long list of craft projects waiting, knitting, crochet, sewing and cross stitch that I would like to see finished. A while ago I purchased some yarn for knitting some socks, in fact teen 2 has put 'knitted socks' on his 2017 Christmas list, for - 2018. He is so cheeky, but alas... correct. I now need to surprise him by knitting him a pair before then. The challenge is on! Maybe in the future I will make another blanket, possibly with a more natural wool type yarn. For now natural or recycled yarn remains expensive and not widely available. If you know of supplies please do leave a comment, I'd love to know and will check them out. Most that I've seen on-line, start from £6 upwards for a 50g ball. Congratulations on your finished blanket! It is beautiful. I can’t wait to see what project you start next. Well done on finishing your blanket. It's beautiful and also a good size. All the blankets I make are lap blankets mainly because I get bored with the few colours I have chosen to use and then stop crocheting. Next time I'll start something simple, but which is multi-coloured. The colours you've used here do reflect nature and moorland. All the best with the next project. Your blanket's fabulous and finished just in time to make use of it this winter. I'm feeling the same at the moment, open to lots of possibilities now that my Christmas knitting is finished. Take a look at the Drops yarn brand, Wool Warehouse sell it. It's very reasonable and there's some 100% wool in the range. They have sales on too from time to time so watch out for those. I bought some baby merino yarn the last time the sale was on, Eleanor wants me to knit her a jumper. I bought 10 balls and it cost me £19.50 and that's 100% wool. 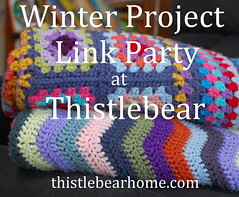 Hi Cathy, thank you for joining in with my link party. Your blanket is beautiful! It's never too late to finish a blanket, in fact it's just in time for this winter. I would love to use more natural yarns in my crochet eventually, but it's not really in my budget right now. I like superwash wool when I can afford a few balls, though. Lion Brand has a nice one that I've slowly added to my stash. This is lovely! It looks so warm and the colours are very nice. Thank you Christina for sharing your thoughts on yarn. When I looked into it over the weekend, one of the things I noted was the felting issue if it wasn't treated. I will look into the 100% wool yarns for now, at least they are more natural, albeit with processing. Your balnket is incredible. I love how the colors flow and the stitch pattern is wonderful. IF it makes you feel better I am constantly thinking or planning out my next project. Well done for finishing your blanket. It is lovely and such yummy colours. A nice big practical size for snuggling too. I was considering joining the attic 24 cal that starts in january.